Saturday has rolled around again and it's time for another six. The Propagator is the excellent host of this meme and if you would like to see what everyone else is doing in their garden this weekend, do pay a visit to his site. We were kept busy watering during the week. One of the good things about so much dryness is that there are fewer weeds to bother about, except perhaps the dreadful euphorbia maculata, or spotted spurge which isn't fazed by anything the weather throws at it. I think it could grow through cement under a blowtorch. But last night we had a thunderstorm which brought us 13 ml of rain and it was lovely to look out into the garden this morning and see the last drops of water shimmering in the sun before a breeze arrived to shake them gently to the ground. An unidentified dahlia given to me in a bag of other unidentified dahlia tubers by a friend. I've waited ages for any of them to flower and this is the first (and perhaps only) one to cooperate. It isn't one of the flouncy attention-seeking dahlias, but I do like its neat and orderly petals with their hints of gold in the centres. 2. My peace rose. Yes, I know I've shown it before, but not this particular photo, and I do love it. I think it's looking particularly fetching in the early morning sunshine. Look at those peachy-pinky gelato colours! 3. I wonder what this strange fungus is that appeared in the garden the other morning? It reminds me of tripe. 4. 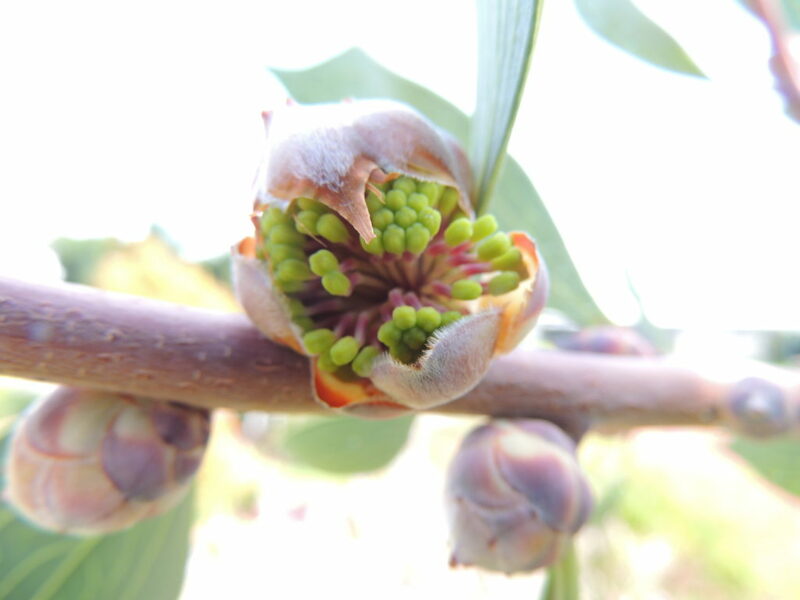 The flower of Hakea Petiolaris, just emerging from its bud on the left and fully open on the right. It's also called the ' sea urchin' hakea. The leaves are leathery and a strange greyish-green and the tree carries its seed pods from the previous year until it's prompted to open them, usually by a bush fire, not unlike other Australian trees such as the Banksia. I hope the seed pods won't be opening here. 5. Beautiful little garnet berries on the Berberis Thunbergii atropurpurea. These little gems could almost hang on a necklace or be clustered together on an earring. When the cold weather arrives, the colours on the plant will be even more intense. 6. Part of my front garden: dry but still coping and cunningly photographed so the neighbouring houses can't be seen-we are living in the suburbs, after all. 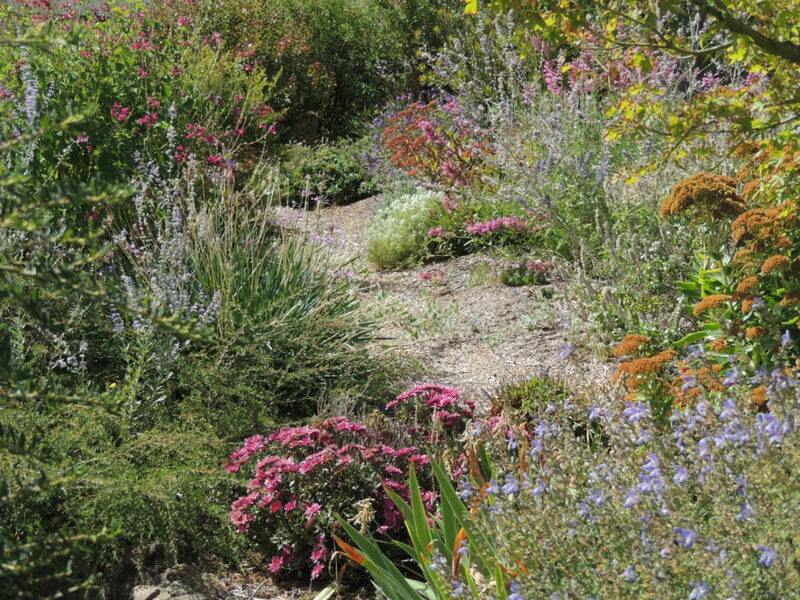 You can see Sedum, Salvia 'Greek Skies', Perovskia, dwarf Chrysanthemums, and Agastache 'Sweet Lili', amongst others. Weather today: Sunny, slightly cloudy, and windy- a bit of everything. 15-26 C.
Next Post Lambley: late Autumn Garden. Jane, your garden looks lovely despite the lack of rain. Jane, your garden looks beautiful despite the lack of rain. You’ve obviously chosen hardy plants. 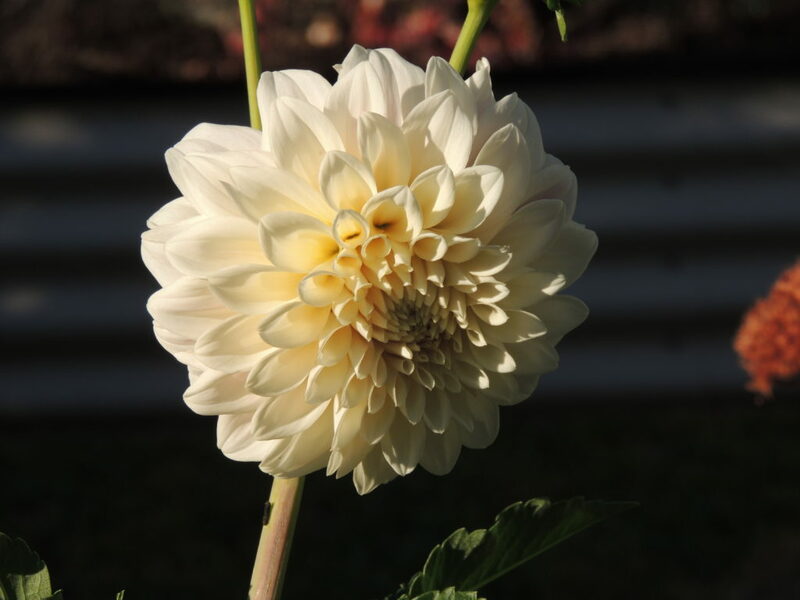 I love the Dhalia. I’ve never seen that colour before and I love the symmetry of the petals. I’m a bit OCD when it comes to flowers so, neat, tidy and symmetrical appeals. It was about 17 degrees down here today with wild winds & heavy rain. Wish I could send some of that moisture up to you. Thank you, Vicki. We’d love some more rain because even with the storm last night, the ground is quite dry. Windy here too, today, and quite unpleasant. Thank you, Fred. I have never seen that in my garden before! Your garden looks lovely, Jane. So glad you had some rain! That Hakea is incredible! Thank you, Ali. The hakea is an uninspiring tree, but the flowers make up for its ordinariness. Thanks Pauline. There’s another more attractive hakea called pincushion which has nicer leaves, but it isn’t frost hardy so I can’t have it here. Jane, these pictures are beautiful! Your plants look great despite dryness, we’ve had a very rainy week and everything is covered with dew every morning. 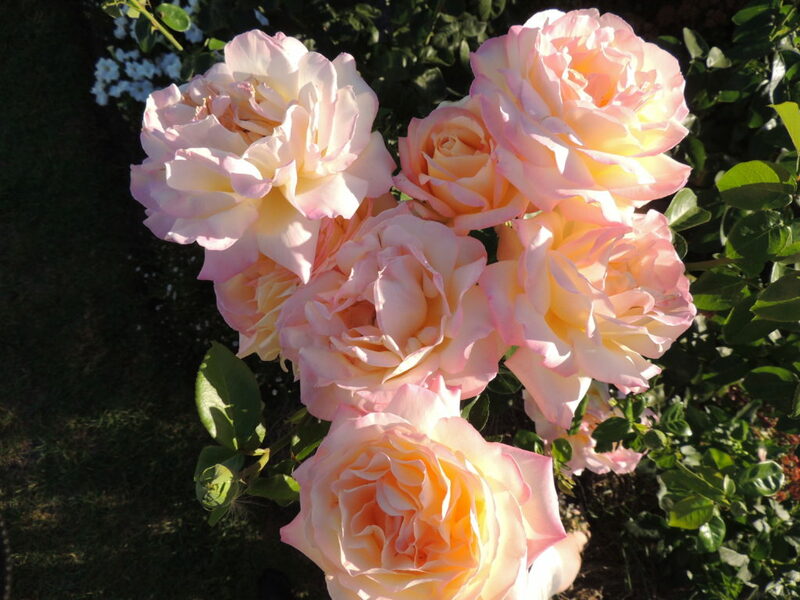 I love the Peace rose and yours looks stunning with so many flowers!my Peace roses have never grown much, they are very prone to powdery mildew and black spot. Have a wonderful weekend. Hi Marcelo, nice to hear from you! Nice that you’ve had some rain. It’s a shame your Peace gets diseases as it’s really such a beautiful rose. It’s quite uncomplaining here. Your garden is beautiful, Jane, those drifts of colour are gorgeous. It’s such a lovely mix of the beautiful, exotic and strange – I definitely agree there’s a bit of a tripe thing going on with that fungus. What a fabulous ‘Peace’ rose and dahlia, beauties both! Thank you Lis. Drifts of colour is a very nice compliment! Even though Peace is rather a commonly found rose, she’s such a good performer, and I do love her. What lovely colours and unusual plants! I wonder how many youngsters have heard of tripe, let alone seen it! Your front garden looks like an English cottage garden on a very good day. English cottage garden? That is a real compliment! Thank you. 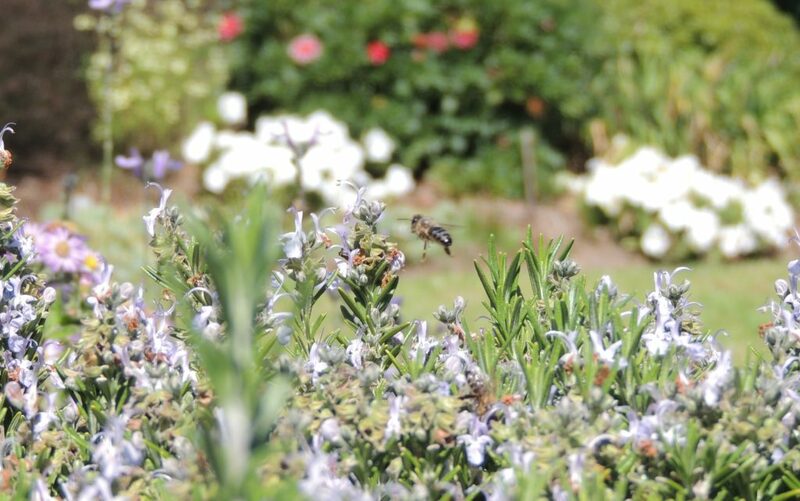 Your front garden looks lovely – a bit Beth Chatto? Beautiful picture of your peace rose – like the way you have caught the light on it. Thank you, Ciar, I see what you mean about Beth Chatto, although it’s more something that ‘seemed like a good idea at the time’! Thank you Sophie. I wish I knew its name! Thank you, Jude. The plants in that front garden are easy care, and the garden is on a slope, so it never gets too wet. What a colourful garden, just goes to show that if you know what you are doing, and plant the right plants for the place, you will succeed. Love the peace rose, especially important just now. Thanks so much Gill. I don’t really know what I’m doing! A lot of it is trial and error, but I do try to select the hardiest things. Yes, they are a great addition to the garden as a bright contrast to green. Oh, those roses are so beautiful!I wouldn’t get tired of them if you included a photo every week! Thanks Jo, I could easily do that! In another month, they’ll just be a happy memory: until October. Your garden must be beautiful, Jane. Isn’t it amazing the difference a nice shower of rain makes. My dahlias had a second flush of flowers, even better than the first after we got 100 overnight in early March. I love your dahlia – such a pretty colour. Thank you Carol. I’m getting there with the garden as there wasn’t much in it when we moved here…so it’s a slow process of trial and error. The fungi looks a lot like cauliflower fungus ! Amazing! The blogging community comes to the fore again! I think you’re right Cathy, though I have never laid eyes on this fungus before. Dr Google tells me it’s edible, but I wouldn’t like to try: it was only tiny anyway and wouldn’t have added much to a meal. Australia! We don’t have parrots in our gardens in Provence! What beautiful colorful stuff. Australia is very far from California where I used to live, and also very far from where I live now. So I’ve not been. I will enjoy seeing the contrasts and all that color! Thank you for dropping by Bonnie, I’ll look forward to learning more about your life in France. Lucky you!! Just Beautiful Jane. How nice would that bunch of Peace Roses look in my vase. It would probably look very nice indeed Chris! It’s over now, sadly, but there are more coming. You’ve obviously chosen all your plants well to suit your conditions, everything looks in top form. I’ve a few that need special care,Christina, but yes, mostly I choose plants that are drought and frost hardy. I’d love to grow hydrangeas, camellias and azaleas, but that’s the path to disappointment! I’m sure you appreciated the rain, Jane! I know I’m always thrilled when we get some. Although we’ve a very slight chance of light rain this coming Thursday, it’s really unlikely that we’ll see any more now until October or later. Our long dry summer is already pounding at the door demanding entrance! I’ve been looking for that Hakea here but they’re not easy to find. On the one occasion I came across the plant it was in a very expensive 15-gallon container, too difficult to transport in the car I was using on that occasion even if I’d been willing to pony up the price. Hi Kris, I think you’ve had it much worse than us re rain-your statistics are quite shocking and I’m amazed that you can keep your wonderful garden going. That hakea has lovely flowers but isn’t a very attractive tree with its strange leaves. There’s another one called petiolaris which has better leaves (and even better flowers) but it isn’t really frost hardy so I don’t grow it here. I love the view through your garden, Jane – really beautiful! Like Kris, I wish I could locate Hakeas here; I think they’d be worth a try in this climate… Hope you aren’t under any immediate threat from fires? Thanks, Amy. 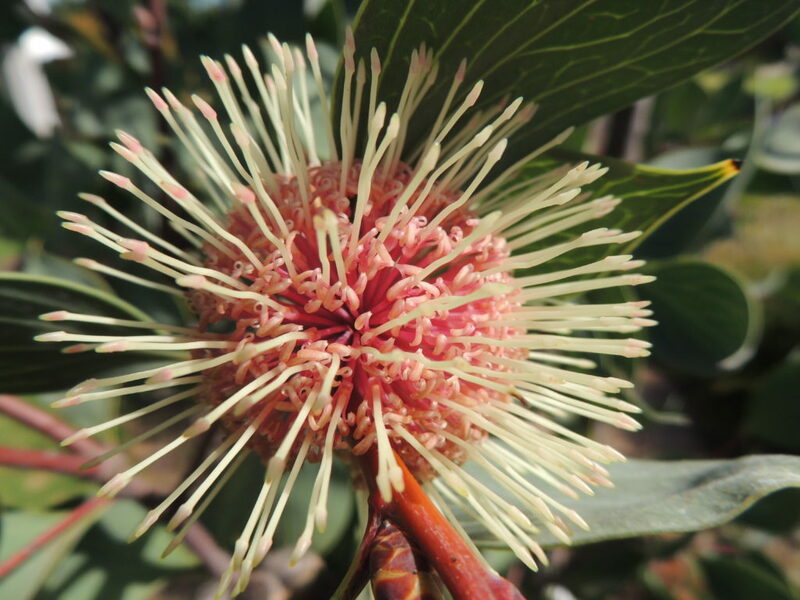 A hakea would probably grow really well for you- they’re very tough. Wish I could send you and Kris some seeds…. There’s no threat from fires. We are in town, so we’d be very unlucky indeed if we had a bushfire here. Whoa – that Hakea is really cool, as is that weird tripe thingy! I think your garden looks fabulous, despite the blowtorch treatment. Hello Jane, lovely to find your garden and the warm colours of Autumn. I fell in love with Australia on a visit a year or so ago and I’m quite sure I will be back at some point. The climate is indeed harsh, although sometimes an abundance of rain can feel just as bad. What we save in time spent watering is more than made up for by the weeding! That’s very true, about the weeding! Thank you for the comments and for dropping in. Lovely to see what’s blooming in your garden at the moment Jane. I particularly like the hakea, most unusual. I’ve never seen anything like that weird fungus. It looks like something from a sci-fi film. I’d keep my eye on it if I were you. Thank you Chloris. Luckily for we mortals, the fungus shrivelled and disappeared before the day was over! Jane, your garden is gorgeous! I too live in the suburbs and have to finesse my photos to avoid snapping a bunch of cars. They do spoil the mood. 😉 I’ve never had luck with dahlias, but I would like to. They’re quite pretty. Well done. Oh, thank you, Alys. That’s only a small part of the garden, so please don’t think it’s all like that! It’s the most successful part! So far that’s the only dahlia that’s done anything. I think I’ll have to wait until next Autumn for more. Thanks for sending me the link to see your Hakea. It is gorgeous. Did you end up getting an ID for your fungus? 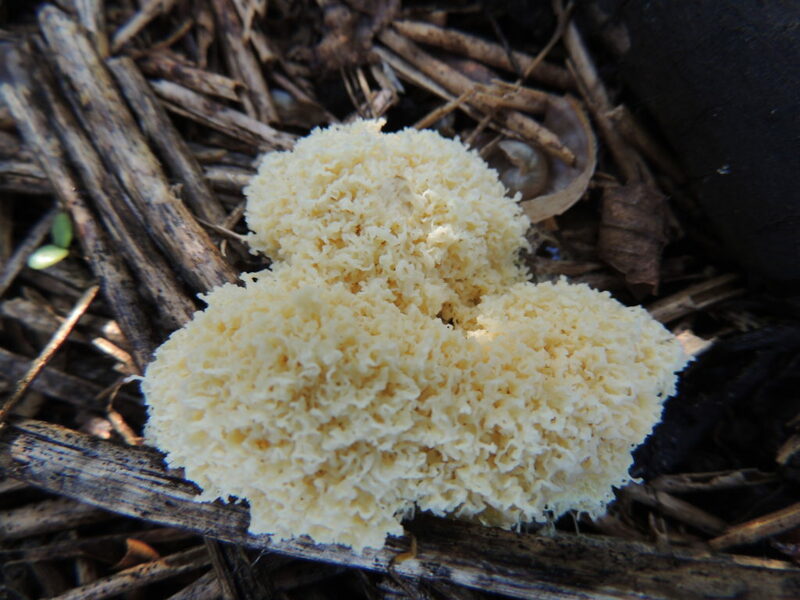 I thought coral fungus. I’ve never heard of a cauliflower fungus. Googled them and they do look alike. No, I didn’t get an ID. thought cauliflower seemed like a good guess so left it there. I haven’t seen it since, but then I think it’s been far too dry for anything of a fungal nature in the garden. Loads of gorgeous landscapes with beautiful trees and garden. Your previous place was incredible! Thank you, Makiko, we loved it and was very hard to leave.